When you are fully charged, you get more done. You have better interactions. Your mind is sharp, and your body is strong. 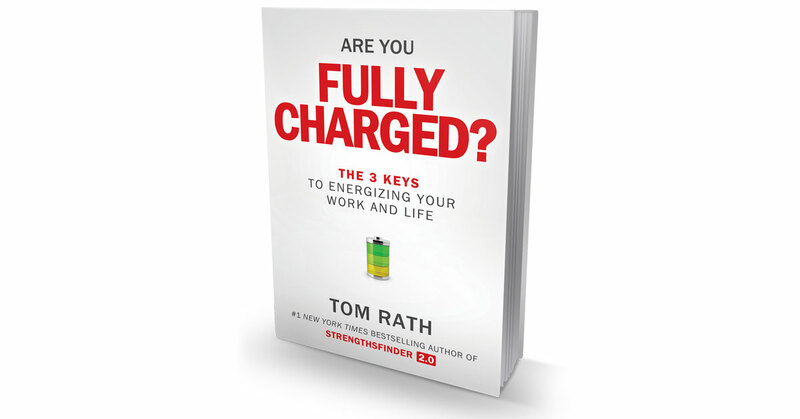 On days when you are fully charged, you experience high levels of engagement and well-being. This charge carries forward, creating an upward cycle for those you care about. I am far more effective in my work on days when I am fully charged. I am also a better husband, dad, and friend. Most notably, I can do more for others. However, until recently, it was unclear to me what specific actions create this daily charge. Fortunately, a new body of research has recently emerged that focuses on the topic of creating daily well-being. Historically, asking people questions and tracking their actions was time-consuming and expensive. As a result, researchers gathered broad, general information about people’s lives and work. Most research on well-being over the past century was based on asking people about their lives over the span of years or decades. When people are asked to reflect on an entire lifetime, the first things they think of are broad concepts like health and wealth. The problem is, these general measures are not very practical for improving people’s lives on a daily basis. Health is the sum of many years. Wealth is not created in a span of days. This is why a different way of measuring what’s important in life is crucial. The time and cost of tracking what people do are now remarkably low. It is much easier to measure thoughts, feelings, and behaviors on a daily, even momentary, basis. These technologies, paired with innovative research methods, have led to a rapid expansion in knowledge about the central elements of daily well-being. Researchers call this daily experience, which is the product of positive and negative experiences (or positive and negative affect) throughout the day. Daily experience is measured by asking people whether they have emotions like happiness, enjoyment, stress, and other feelings within a given day. This distinction between daily well-being and broad evaluation of life satisfaction is important because it leads to very different conclusions about the best investment of time and resources. Traditional measures of life satisfaction, for example, might suggest putting a great deal of energy into increasing your income. Yet, although life satisfaction scores continue to increase (almost indefinitely) with income, making more money does not actually change daily experience once people reach an income threshold. In the United States, for example, daily well-being does not show any statistically significant increases after someone reaches $75,000 of annual household income. While this figure has received a good deal of attention, people tend to miss the fact that almost all of the gains in daily well-being associated with increases in income occur below the $40,000 level. Essentially, a certain income level is necessary for food, shelter, and preventing daily worries, but once you have reached that basic level of financial security, making more money is unlikely to lead to better days. The study of daily well-being is also upending the conventional wisdom that wealthier countries have happier citizens. In the past, when scientists looked at life satisfaction, the wealthiest countries were consistently at the top of the national well-being rankings. But when Gallup asked people in 138 countries about their daily experience, the results told a very different story. The country with the highest “positive experience” score was Paraguay, a nation that ranks 105th in terms of its wealth (measured by GDP per capita). Among the top five countries on this daily well-being index, four were in the bottom half of the wealthiest countries list. This research is encouraging to me because it suggests that daily well-being does not depend on accumulating riches or living in a wealthy country. The more I’ve learned about the difference between long-term evaluation and daily experience, the more I’ve grown to understand the importance of the latter. Personally, I care a lot more about laughing, smiling, and enjoying moments with my wife and kids today than how I might rate my overall life satisfaction 10 years from now. And trying to help people improve their day-to-day experiences is more practical than trying to improve their life satisfaction over time. Your overall satisfaction with life certainly matters. But you create meaningful change in moments and days, not years and decades. It is easier to improve your own happiness — and the well-being of others — when you focus on doing it right now. Taking small, meaningful actions today is the best way to make changes. And eventually, these small changes will lead to important long-term outcomes. When we surveyed more than 10,000 people to see how they were doing across these three areas, we found that most people struggle on a daily basis. For example, when we asked them to think about their entire day yesterday, a mere 11 percent reported having a great deal of energy. Clearly, most people are operating well below their capacity. As a result, they are less effective in their work. Their interactions with friends and family are nowhere near as good as they could be. And their physical health worsens as days with too much stress and too little activity accumulate. It is time for this to change. The good news is that you don’t have to go on a retreat in the woods to find meaning, you don’t need to find new friends at a cocktail party to have better interactions, and you certainly don’t need to run a marathon or embark on a fad diet to create physical energy. The biggest changes for your daily well-being start with a few small steps. Adapted from Are You Fully Charged? by Tom Rath (Silicon Guild, May 2015) for LinkedIn. I am recommending this easy to read and doable health and wellness habit change applications-packed book to all my positive psychology coaching clients. Thanks Tom Rath for reminding us we all matter. Every small daily interaction adds to our momentum of belonging and healthy feelings of connection. What wonderful words to read – “You don’t need wealth for daily well-being” as I finalise material for my ContemporaryCurrencies: Does money still matter most?” workshop for Vivid Ideas Sydney. Tom, I shall have you ‘by my side’ on the 25th as I continue to try and change the conversations my city – Sydney – and countries – Australia and New Zealand – are having about money and well-being. Poverty and inequality are corrosive, and need to be resolved for society to flourish. And, in addition to creating a living wage, we also need to be having these sorts of conversations about our attention and energy, two of my #contemporarycurrencies.